The final trading session of the quarter saw major equity benchmarks leap forward, closing out the week on a high note. “Friday’s gains capped a stellar three months for stocks, with the Dow and S&P posting the biggest first-quarter gain since 1998. Despite Friday’s decline, the Nasdaq had its best first quarter since 1991, according to the Stock Trader’s Almanac. For the quarter, the Dow gained 8.1%, the S&P 500 advanced 12% and the Nasdaq rose a whopping 19% since New Year’s Day. The Dow and S&P 500 are at the highest levels since 2008, while the Nasdaq is at its highest point since 2000″ writes Ben Rooney. The commodity space saw crude finish out the day relatively flat, as the fossil fuel is nearing the $100/barrel level. If it were to cross into double digit territory it may provide some relief at the pump, as gas prices have been relatively high around the majority of the country. Gold posted a strong session, as the precious metal tacked on nearly 16 points, or 1%, bringing gains to around 6% for the entire quarter. In an effort to keep investors up to date with financial markets, we outline two of the biggest ETF movers from the final day of Q1 [see also Does GLD Really Hold Gold, Or is it a Scam?]. 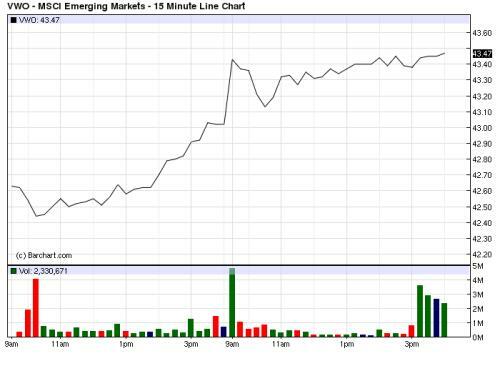 One of the biggest winners came from the Emerging Markets ETF (VWO), the largest emerging market ETF on the market. The fund jumped by just over 1% on the day, as markets cheered along benchmarks on the final day of the quarter. Emerging market products tend to have high betas and therefore produce swifter movements than most general equity products, explaining the stellar performance on the day. The fund is up over 13% on the year and saw its daily trading volume nearly double for today’s session [see also Three Years Later: Best Performing ETFs Since Markets Bottomed Out]. 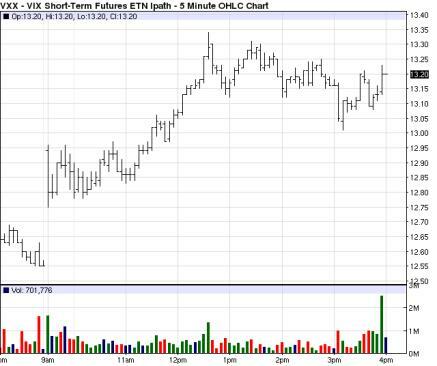 One of the biggest ETF losers was the S&P 500 VIX Short-Term Futures ETN (VXX), which surrendered 2.7% in Friday’s session alone. As can be expected, today’s strong markets led to a few bumps in the road for VXX, as the fund is more or less designed to profit from market woes, not gains. But this has been the story for much of 2012, as VXX is now down over 53% on the year, with almost 10% of total losses coming in the last week. While this ETN is one of the most popular trading and speculative instruments available, some investors are still getting burned by the volatility giant. It is important to think of VXX as a delicate trading tool that should only be utilized by those who truly understand its behaviors and nuances [see also How The VIX ETN Lost 50% In 48 Hours].